John 3:20-21, the Verse of the Day for September 29, 2015, speaks of those who prefer to walk in darkness rather than to walk in the light. To understand more fully those whom the passage refers to, we add verse 19 to the selected verses for today. But if we [really] walk in the Light [that is, live each and every day in conformity with the precepts of God], as He Himself is in the Light, we have [true, unbroken] fellowship with one another [He with us, and we with Him], and the blood of Jesus His Son cleanses us from all sin [by erasing the stain of sin, keeping us cleansed from sin in all its forms and manifestations]. In light of the Gospel of Matthew’s portrayal of Jesus as the King, the expression “the kingdom of God” is used four times in the first book of the Gospel writers: Matthew 12:28; 19:24; 21:31, 43. In its simplest form, the term is translated from the Greek word basileia, referring to the reign, rulership, authority or dominion of a king. In the Old Testament the Hebrew word malkūt generally refers to the authority or rule of the heavenly king. The Psalmist declares: “They shall speak of the glory of thy kingdom, and tell of thy power.… Thy kingdom is an everlasting kingdom, and thy dominion endures throughout all generations” (Psalm 145; 11, 13) “The Lord has established his throne in the heavens, and his kingdom rules over all” (Psalm 103:19). Ultimately, this sovereign rule of God, which Jesus Christ initiated with his earthly life and ministry, will be fulfilled when “the kingdom of the world has become the kingdom of our Lord and of his Christ” (Revelation 11:15). The Verse of the Day and other references to the Kingdom of God remind us that we are . . .
Of the Jubilee extended to His bondservants. Ron Kenoly also provides a lively reminder that “Righteousness, Peace and Joy in the Holy Ghost” are essential elements of the Kingdom of God. 30 For we know Him who said, “Vengeance is Mine [retribution and the deliverance of justice rest with Me], I will repay [the wrongdoer].” And again, “The Lord will judge His people.” 31 It is a fearful and terrifying thing to fall into the hands of the living God [incurring His judgment and wrath]. Associated with waiting on the Lord is the character trait of patience or endurance or perseverance, steadfastly bearing up under and remaining faithful while waiting. 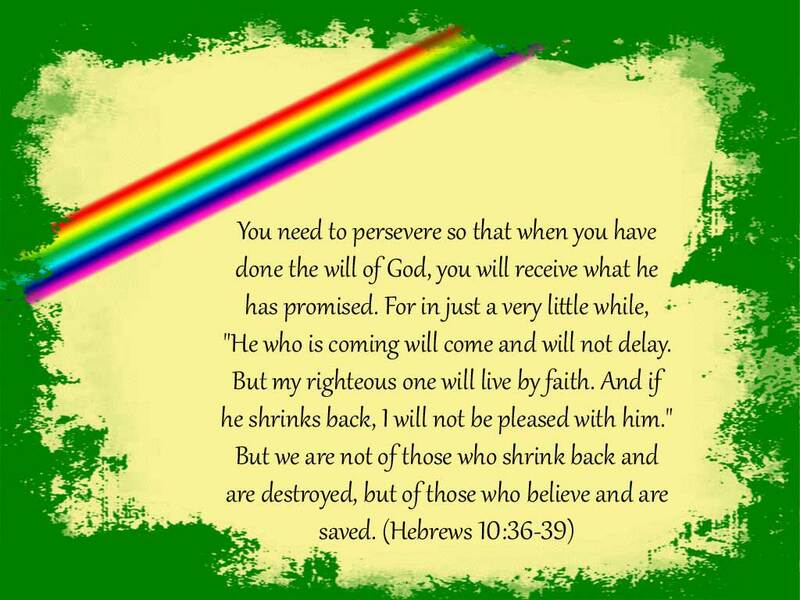 Patience or perseverance, a fruit of the spirit, should be evident in our lives, as we wait on the Lord. When we examine one of the words for “patience,” hupomone, we see a compound word derived from hupo, meaning under and meno, meaning “to stay, remain, abide,” literally abiding under. The verb hupomeno means to stay under (behind), i.e. remain; figuratively, to undergo, i.e. bear (trials), have fortitude, to persevere — abide, endure, (take) patient(-ly), suffer, tarry behind. The root idea of the noun hupomone is that of remaining under some discipline, subjecting one’s self to something which demands the yielding of the will to something against which one naturally would rebel. It means cheerful (or hopeful) endurance, constancy — enduring, patience, patient continuance (waiting). It is a bearing up in a way that honors and glorifies our heavenly Father, not merely to grin and bear it. Clearly who God is and who He wants us to be. Not only is patience its own reward, but God also honors and rewards our patience, as we patiently wait on Him. So rejoice, O children of Zion, and delight in the Lord, your God; For He has given you the early [autumn] rain in vindication And He has poured down the rain for you, The early [autumn] rain and the late [spring] rain, as before. Neither say they in their heart, Let us now fear the LORD our God, that gives rain, both the former and the latter, in his season: he reserves unto us the appointed weeks of the harvest. See how the wind begins to whisper. Soon it’s gonna rain, what are we gonna do? The Book of James also reminds us the importance of prayer in conjunction with the harvest. 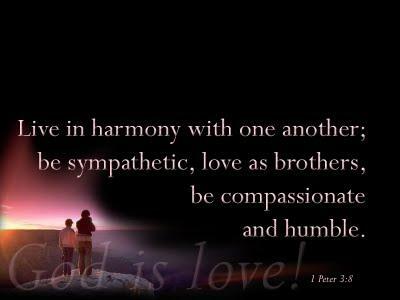 Be patient therefore, brethren, unto the coming of the Lord. Behold, the husbandman waits for the precious fruit of the earth, and has long patience for it, until he receives the early and latter rain. 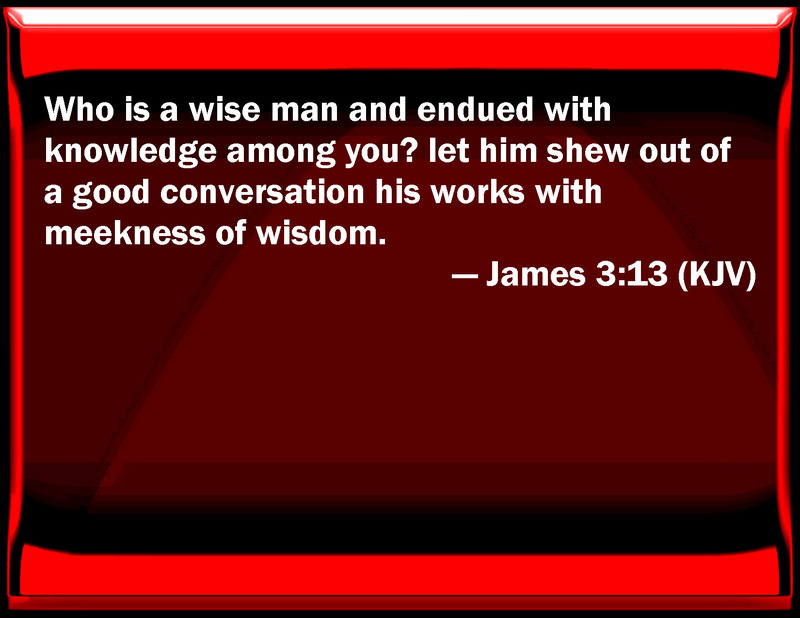 [Heavenly Versus Demonic Wisdom] Who is wise and understanding among you? Let him show by good conduct that his works are done in the meekness of wisdom. So your fragrance arouses us as we awake. This desire, a fire, flames the passion deep within. Assured that all who pursue you shall also find. So we seek the spirit of wisdom’s good pleasure. The last line of the poem brings to mind another song that captures the essence of that for which we are seeking: “Seekers of Your Heart” rendered by Steve Green, Sandi Patty and Larnelle Harris. For Christian believers nothing is more satisfying than to know that God is love and that God loves us, and nothing can separate us from that love. “Yes, I am the vine; you are the branches. Those who remain in me, and I in them, will produce much fruit. For apart from me you can do nothing. When you produce much fruit, you are my true disciples. This brings great glory to my Father. This reference relates the parable of the vinedresser, the vine, the branches and the fruit. That is, it explained how the Twelve were to produce a spiritual harvest for God. The passage from John 15 records how Jesus, during the evening when he was betrayed and captured, said to the eleven apostles who remained at the table with him (Judas had departed and gone to betray the Lord), that his Father was a “vinedresser” (grape farmer), or “husbandman” as some translations have it, and that he, Jesus, was “the true vine”, and that those apostles were “branches” who were attached to Jesus, the Vine. In order to be fruitful the branches must “abide” in the vine. When the branches remain intact with the vine, God is glorified as the branches bear much fruit. When thinking of fruit, the fruit of the spirit comes to mind, and what is the principal fruit of the passage from Galatians 5:22-24? 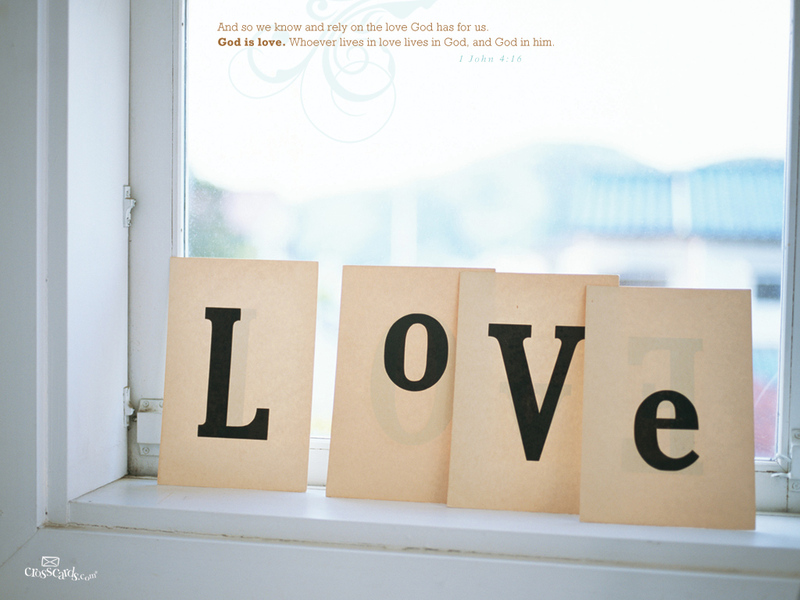 Love, as the Scriptures also remind us. We put off the old, put on the new, and leave the past behind. We follow Christ and are renewed in the spirit of our mind. Quit backbiting—God doesn’t want to hear it. Don’t retaliate—move in the opposite spirit. 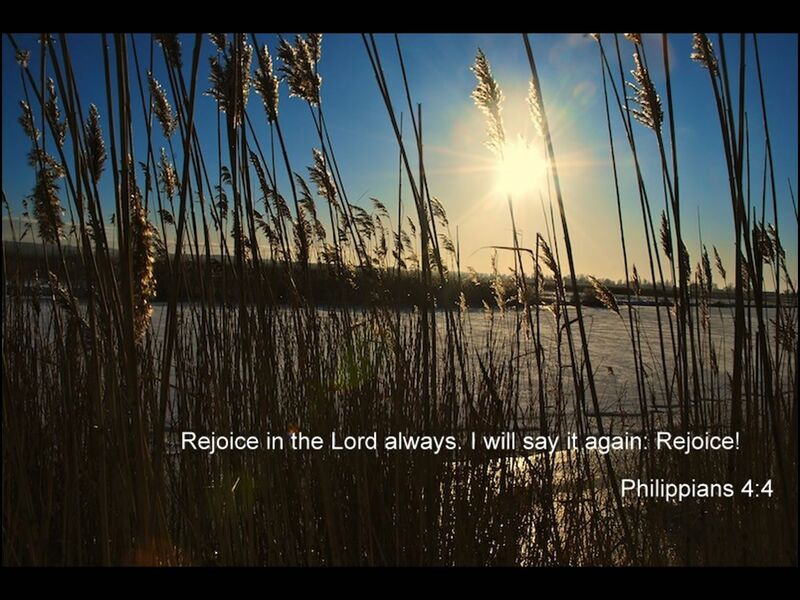 The letter to the Philippians, written while Paul was in prison, is also known as the “Epistle of Joy” because of this particular fruit of the spirit is mentioned repeatedly throughout the four chapters. We note that in chapter 4 some form of the word joy is found in verses 1, 4, and 10.
neither be ye sorry; for the joy of the LORD is your strength. Since Christ has set us free, we are no longer bound. To show thanks to Him we will go to any length. We will jump and shout, leap for joy and spin around. We will praise Him; the joy of the Lord is our strength. We glorify His name and raise a joyful sound. We know an inner river of joy flows freely. Cleansed from within by His precious blood, we are made whole. With a voice of triumph we shout for the victory. At all times we rejoice, for God is in control. From our soul His praises we will joyfully extol. We celebrate and rejoice with exceeding great joy.